I've been to several Action stores in the are over a period of the last month. Never did I find the Eurodomest (or the Impuls) set and I was told it was not coming back; despite the website still listing them. I've read on several domotica forums that they also mention the Eurodomest is replaced by Pro-Max. They now sell similar sets from Pro-Max. I've tried to see if they would work with any of the apps...... and of course they didn't. But I did get the remote recognised and if I flip a switch on the remote, the test in the flow manager also turns on and off; but not the lights and/or the receiver. Will it even be possible (at some point) to have this new set from Action working with Homey? Could this set be added to the Action App? Or should I just bring them back? I don't have a clue what they are on about, but on some domotica forums they are dissecting these Pro-Max switch sets too. These switches are on my to-do list, they will be added to the Action app in the near future. @DennisH Is on your to-do list also the Eurodomest remote ? Wouldn't it be more logical to put all these different brands in separate apps? @DennisH although that might work - didn't test it yet- I'd like to use the remote completely independent, as I can with the KaKu remote. I am not deep into 433 specs yet, but if you can copy the signal for pairing the socket, couldn't you use that procedure for pairing the remote as well ? You are listening for the remote's signal right? So if you know that 'type-of-signal' which you emulate with Homey to turn on a socket, then you should also be able to use that just as an input for a trigger. Again, just like the KaKu devices. That's good enough for me. Thanks, and I'll just wait for the update. Let me know if you need someone to test. Would this help for the pro-max switches, this was achieved with the codechecker from Kaku. The address never changes if a button is pressed, neither does the Channel: number. Unit varies from 1,2,3,4. Group only varies if the All On or All Off button is pressed. Any news/ETA about the Promax action switch? I'm also anxiously waiting for this support. I bought them from Action assuming they were already supported. yep, but no promax supported sadly. @DennisH ;how is progress going? I saw in github you made some progress and added the driver for de ProMax in de Action app wicht will come with 1.0.15. How is the new version coming along? Bought some Pro-max appliances today. Is there a possibility to install the .15 version already? Thanks! Just updated to the new version of the Action app. Promax is supported! The link is not working But thx! Here the promax sockets wont work. 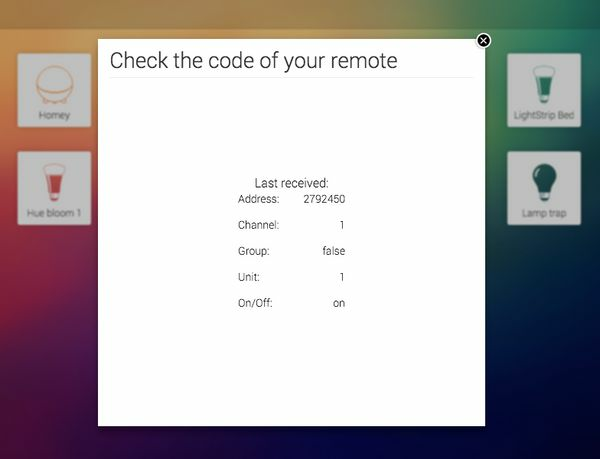 De remote control works with the app but when I want to add a socket I have to push the on and off button till the bars are full but nothing happend. Did I do something wrong? Can somebody help me? How can i get in the code checker? I found on Git it should be in the devices add list. But i cannot find it. I want to find the code of some 433 sockets I have which do not seem to work with any of the apps. I had the same. After reboot Homey it was possible to ad the socket. 2 Days later a new socket, i had to do the same: first a reboot then adding the socket. You don't have to search for the Code Checker, it is removed from the App! There is no Code Checker anymore. Thanks I will give it a try when I am home. Reboot you mean put homey upside down? Or also unplug? For me it was enough to choose "opnieuw opstarten" in the menu system. Rebooting is not resetting and not the same as PTP (pull the plug). I have tried It again after "opnieuw opstarten" but still not working. I think I dont have the promax but they look like the promax. The box says Flamingo SF-501. I bought it this week @ the action. Is this diffrent then the promax switch?